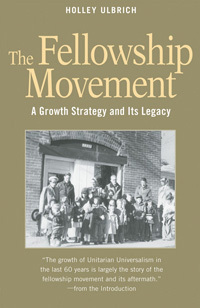 The fellowship movement officially ended in 1967, but its influence lives on today. The lay-led fellowship movement was a twenty-year experiment in do-it-yourself religion that began as a growth strategy of the American Unitarian Association in 1948. The movement gave birth to small, lay-led fellowships from Cape Cod to Honolulu. Today these comprise a third of our Unitarian Universalist congregations. The fellowship movement officially ended in 1967, but its influence lives on today–in a freer and more participatory style of worship, increased focus on shared and small group ministry and the way we found and nurture new congregations. Ulbrich gives both the story of the movement and the stories of individual fellowships around the country. Brilliant Inspiration or Disastrous Strategy? The fact that Unitarian Universalism is alive and well in the twenty-first century is due in no small part to the fellowship movement. It is a livelier, more vital, more diverse religious movement because of the pioneers who took the faith to new places and created a frontier kind of religion. Just as the frontier in the American West settled into established communities, with a scattering of ghost towns, so likewise did these pioneer settlements. But change took place among the senior partners in Unitarian Universalism as well. The entire movement absorbed some of the empowerment of the laity, modified its forms of worship, experimented with new ways to be in community, and appreciated the value of small communities within the larger whole. Unitarian Universalism today has been not only challenged but also enriched and revitalized by the unique phenomenon of the fellowship movement.